Koh Laoya or Koh Lao Ya as it is often seen written, sits off the southern end of Koh Chang and comprises three small islands, Koh Laoya Nai, Koh Laoya Klang and Koh Laoya Nok. It is easily reached from Salak Phet or Bang Bao as part of day tours around the islands though it does also have a small old style Thai resort. 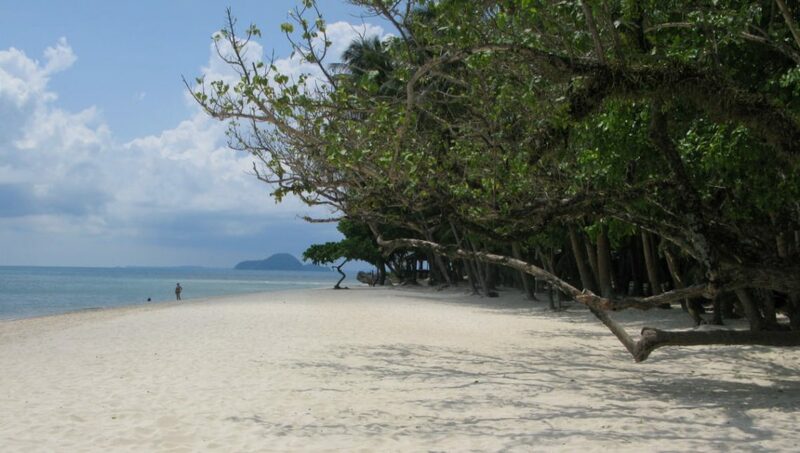 The largest island, Koh Laoya Nai is about a 1 kilometre long and wide, with hillside jungle on its interior and an almost perfect long white sands beach, lapped by shallow clear blue waters, running the length of its eastern shore. There are great views across to Long Beach on Koh Chang whilst, at its top end, Koh Klum, a large uninhabited island just out of Bang Bao, sits on the horizon. Also at this far end, the main island is or was joined to the tiny Koh Laoya Klang by a wooden bridge, but this has fallen into disrepair, making the crossing, at present, not possible. The forested rock of Koh Laoya Nok lies just a bit further south of them both. A solitary resort, used almost exclusively by Thai packages, flanks the only beach at Koh Laoya, with a restaurant about halfway down and a pier at the northern end. The resort does not accept guests outside of the organised tours, happy instead to receive a steady stream of daytrippers, though in nothing like the numbers experienced by Koh Wai. 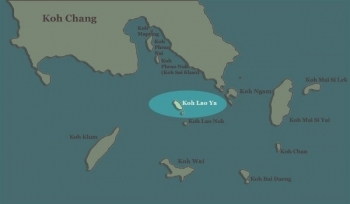 Nor Nou Kai Bae Huts Speedboat and the Mr Khai 3 island tour, in particular, visit the island as part of their itinerary. Do please contact us for bookings. By hiring a launch out of Salak Phet bay at 1,500bt or so, you can make your own tour to here and the other nearby islands such as Koh Ngam. The adventurous, of course, kayak and it is easy to rent one from a resort around the bay at either Salak Phet or Chek Bae for 300bt, or thereabouts, per half day. 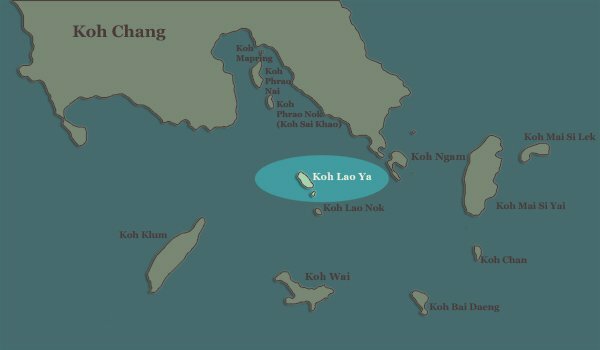 Koh Laoya, however, is a fair way out to sea, so we suggest only experienced kayakers should attempt it.Please click on the Koh Laoya map to expand.